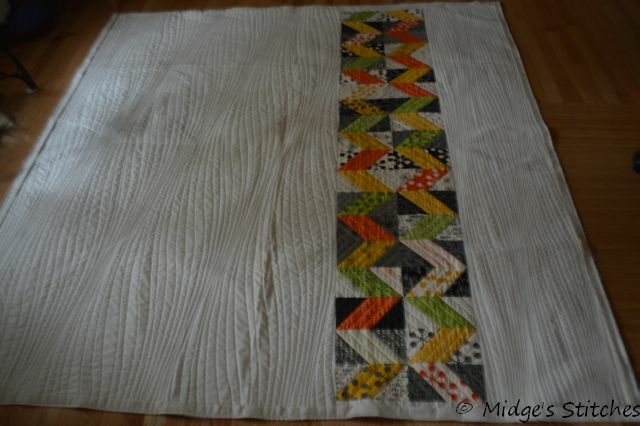 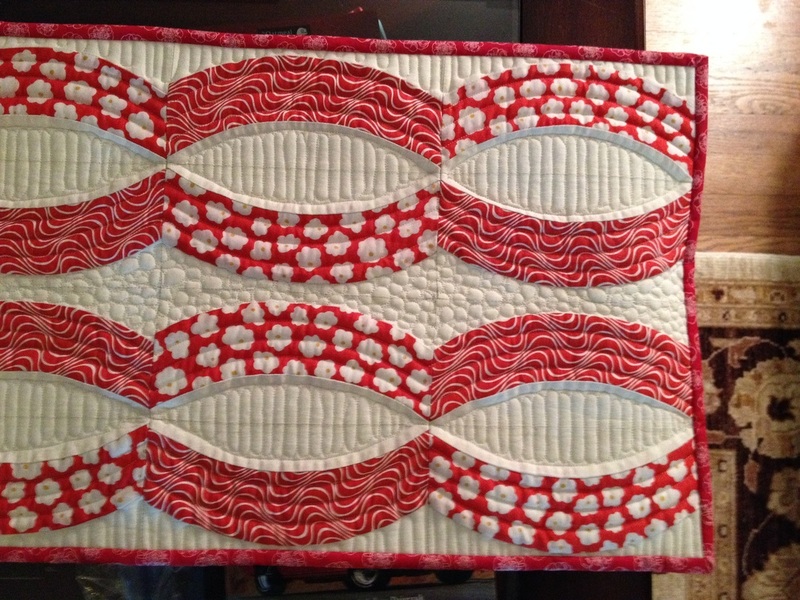 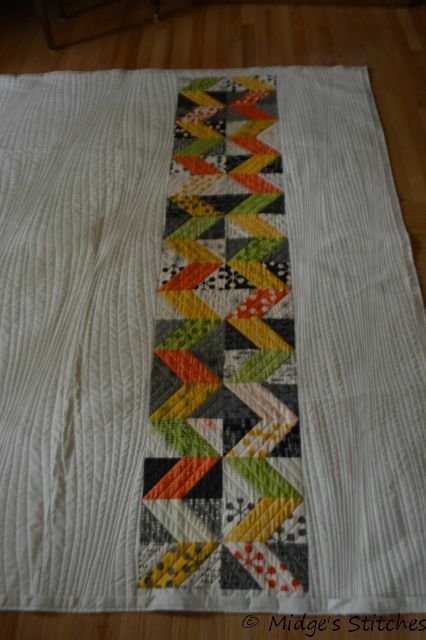 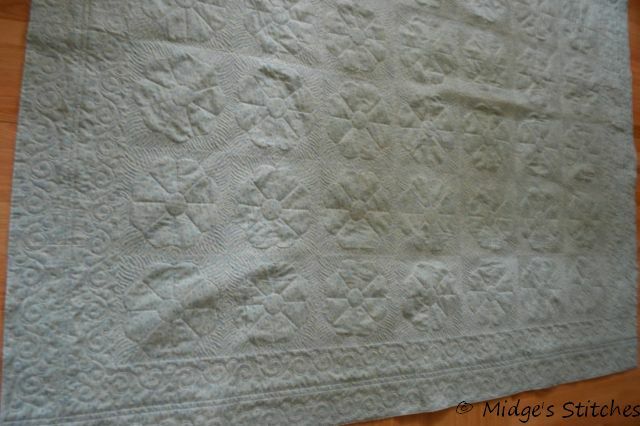 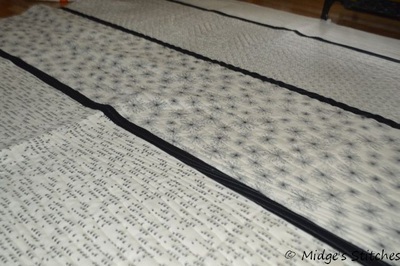 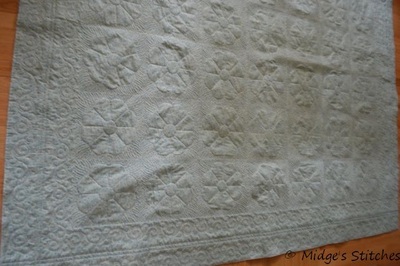 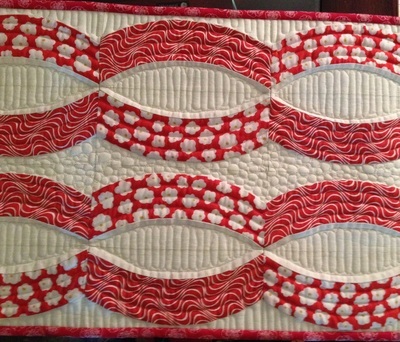 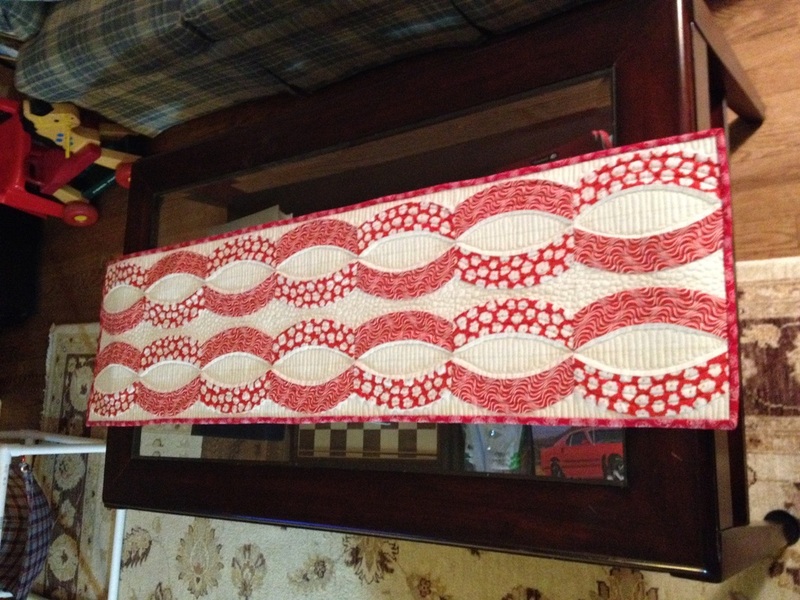 This is the table runner pattern that is included with the Quick Curve Ruler from Sew Kind of Wonderful by Jenny Pedigo. 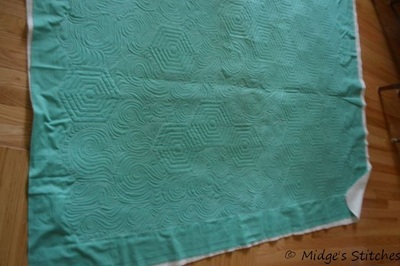 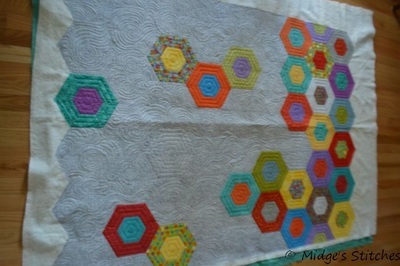 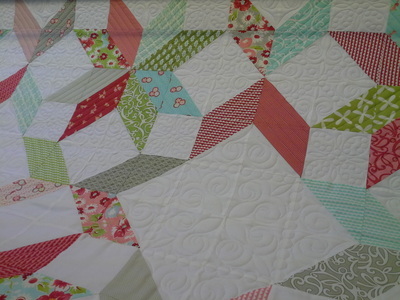 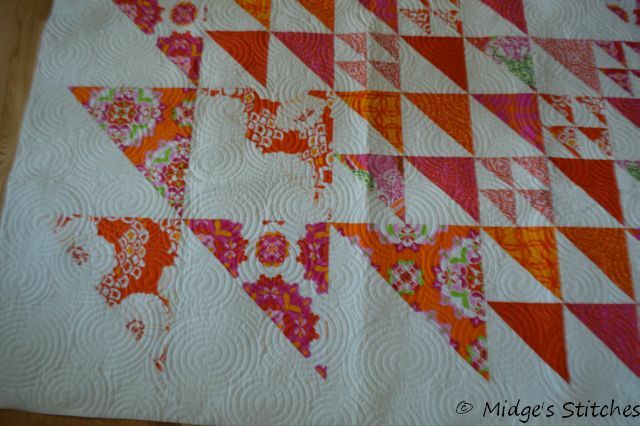 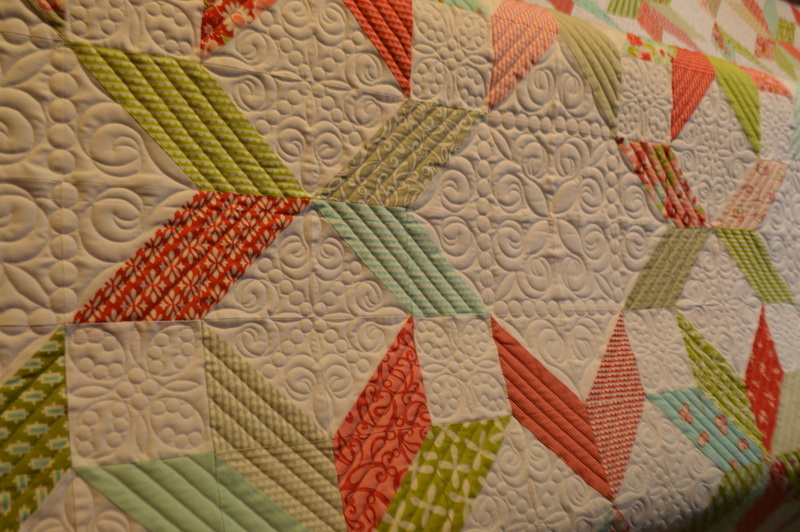 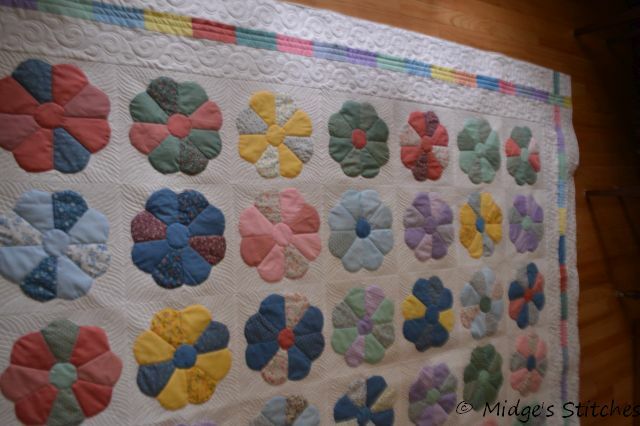 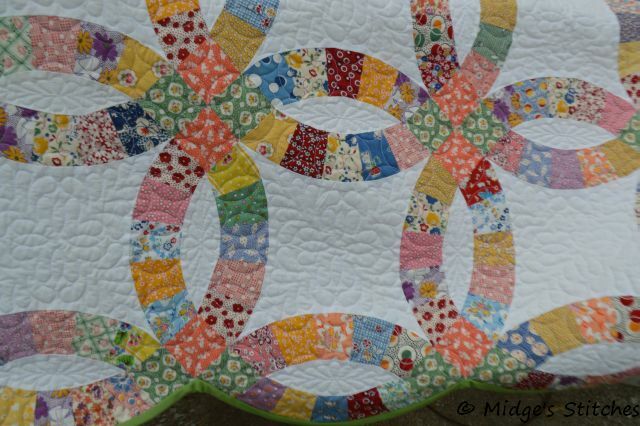 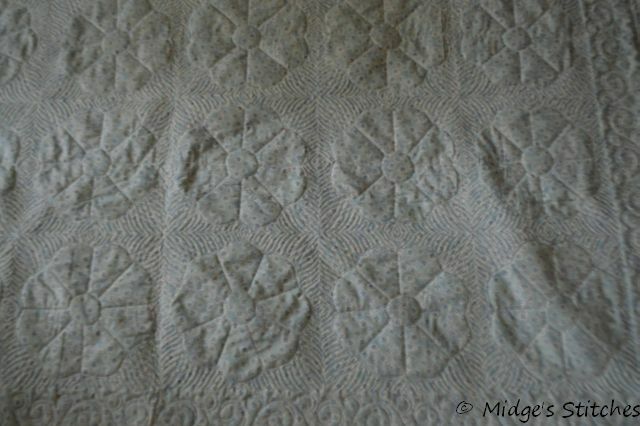 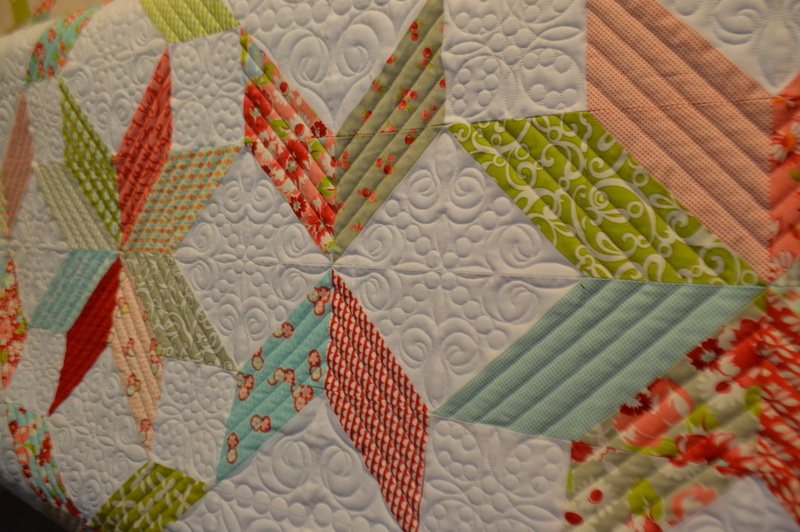 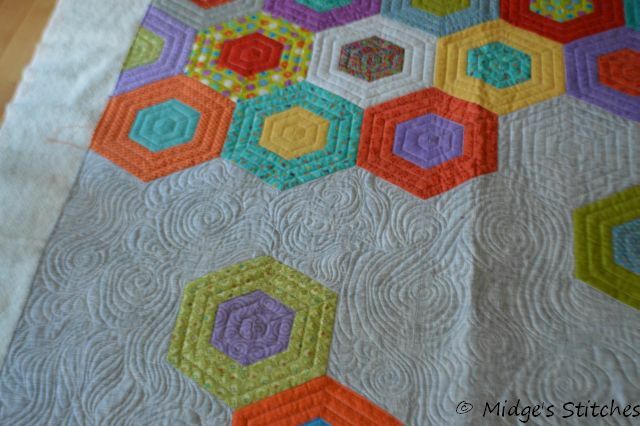 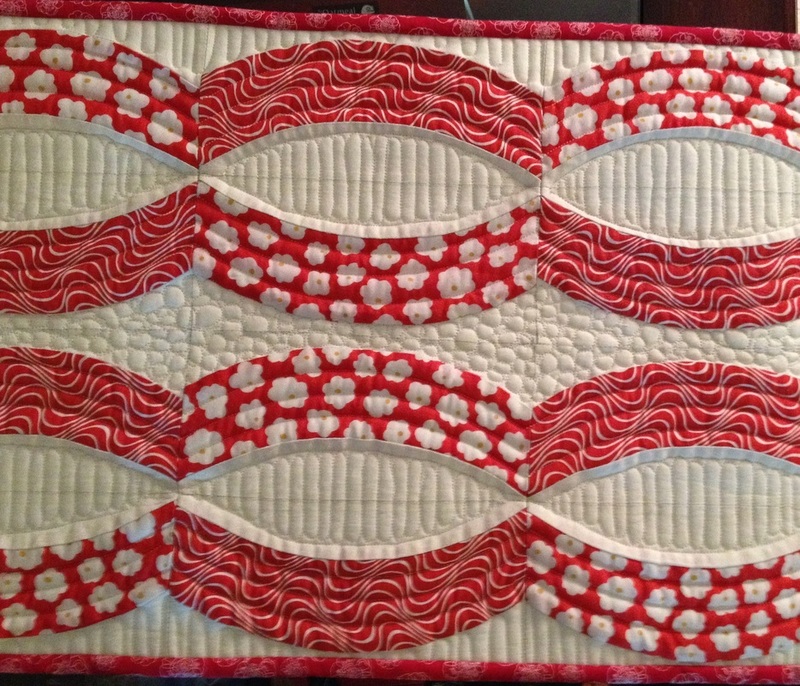 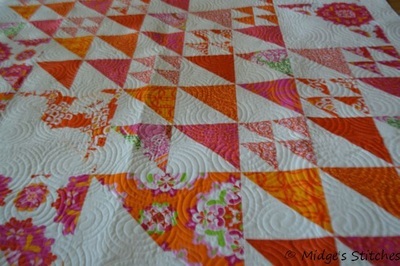 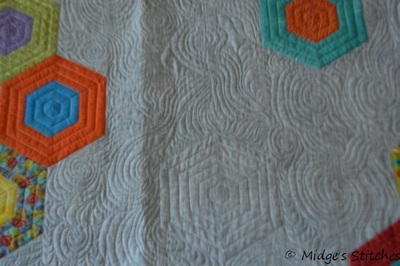 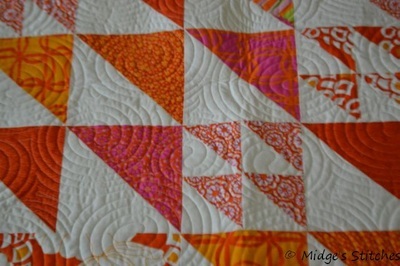 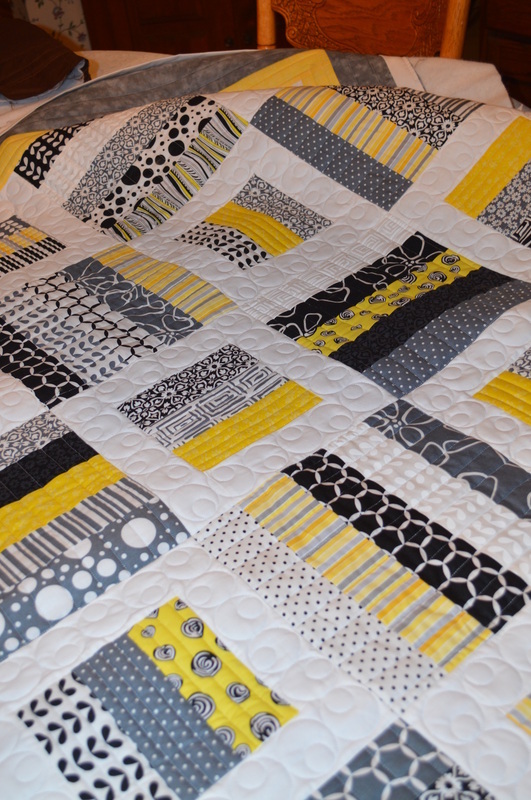 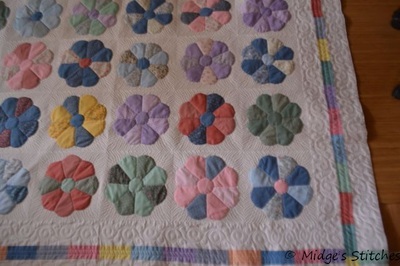 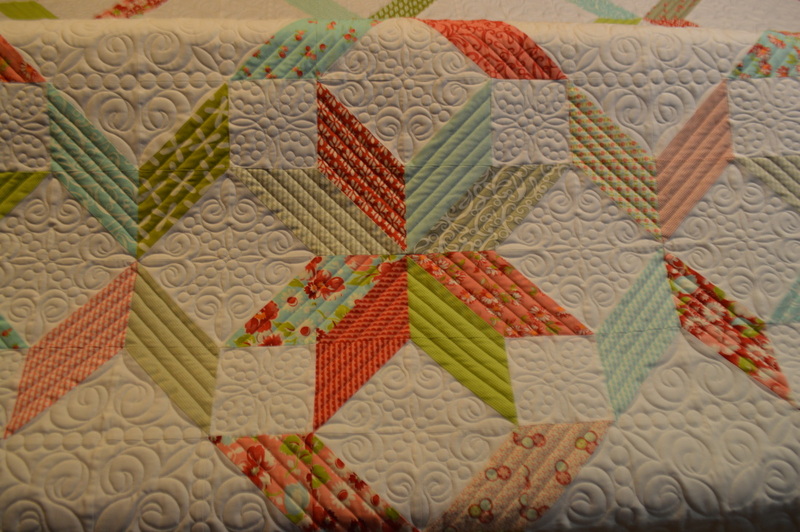 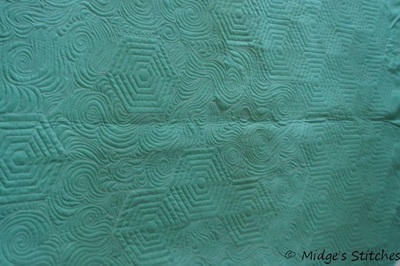 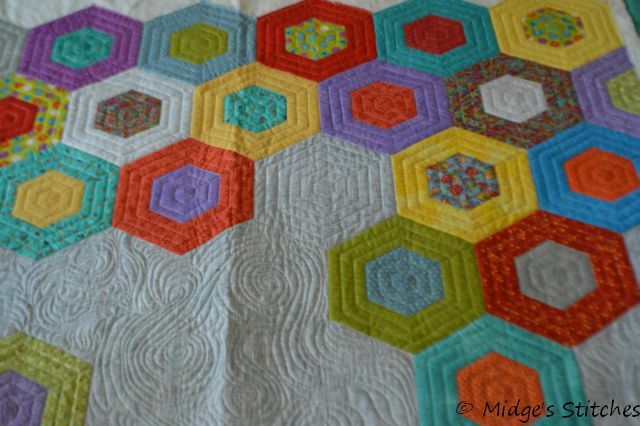 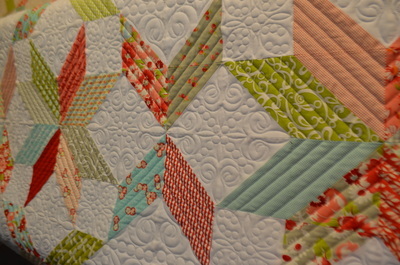 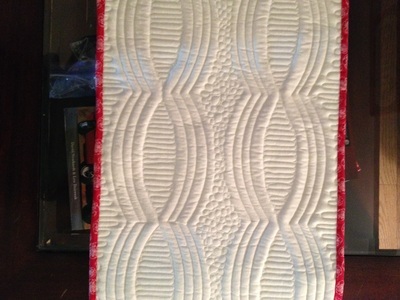 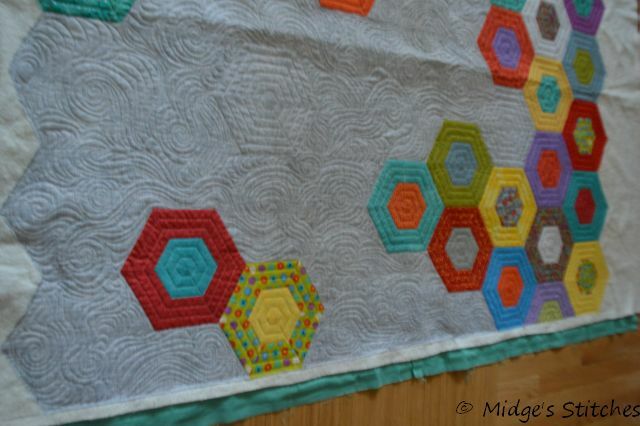 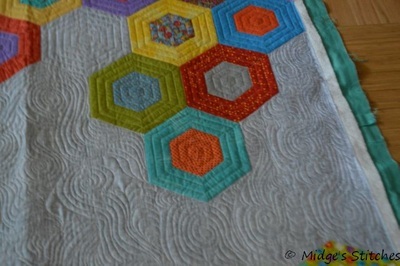 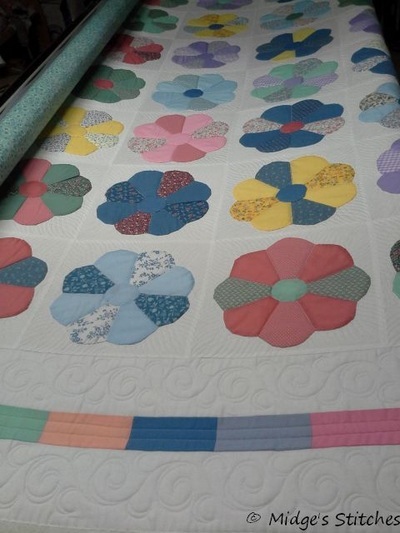 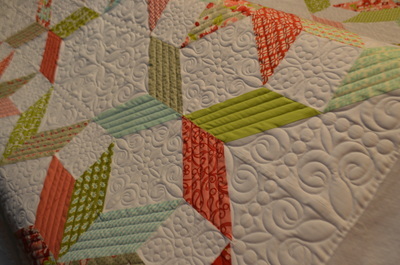 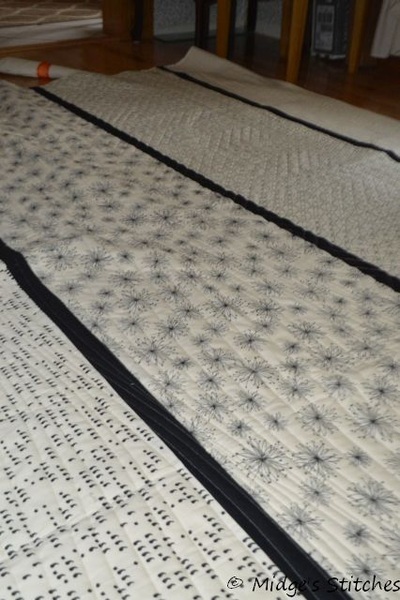 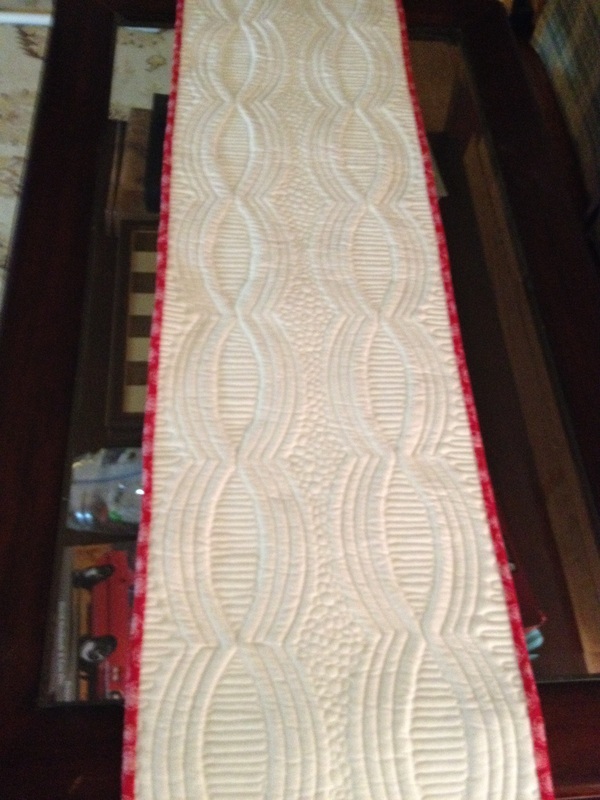 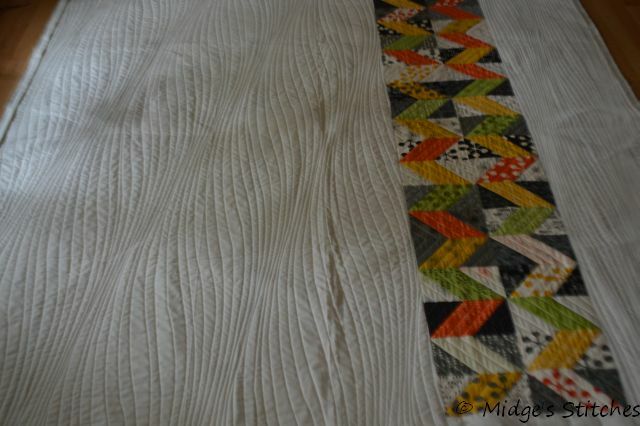 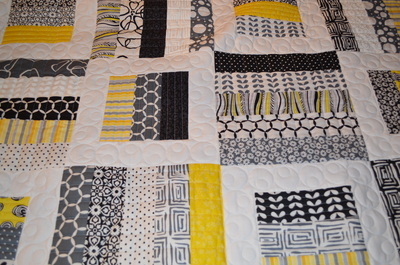 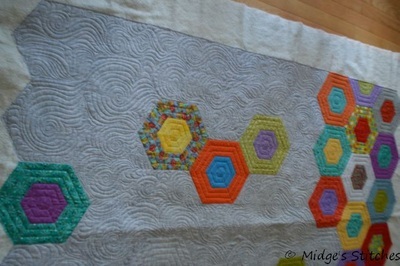 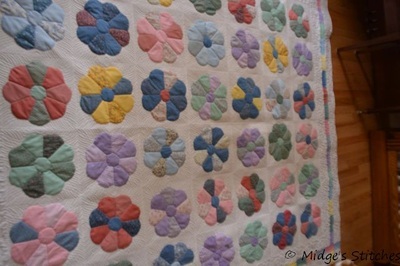 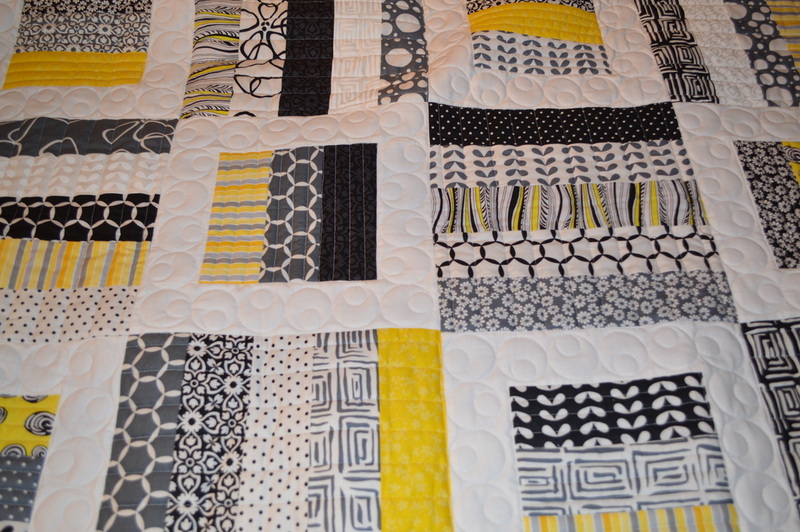 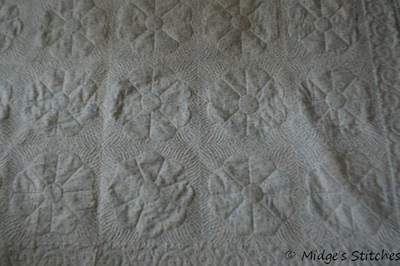 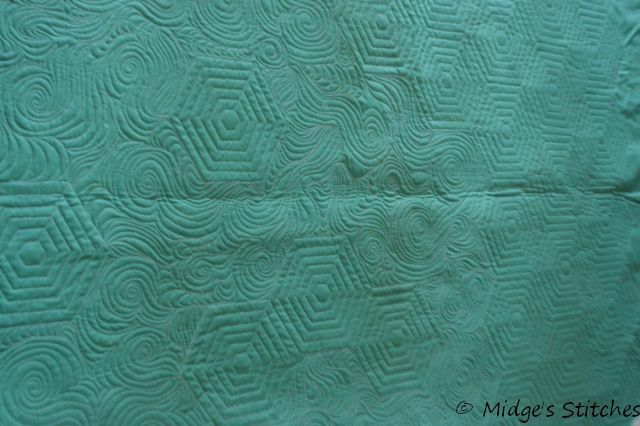 I have fallen in love with the modern style of quilting and am fascinated by some of the work out there. 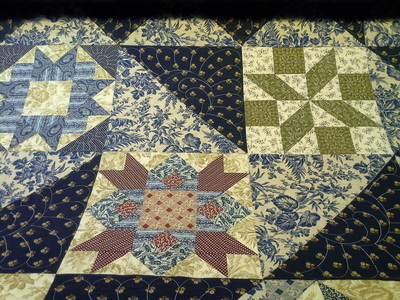 This was pieced and quilted by me. It was done free motion, except for the arcs. 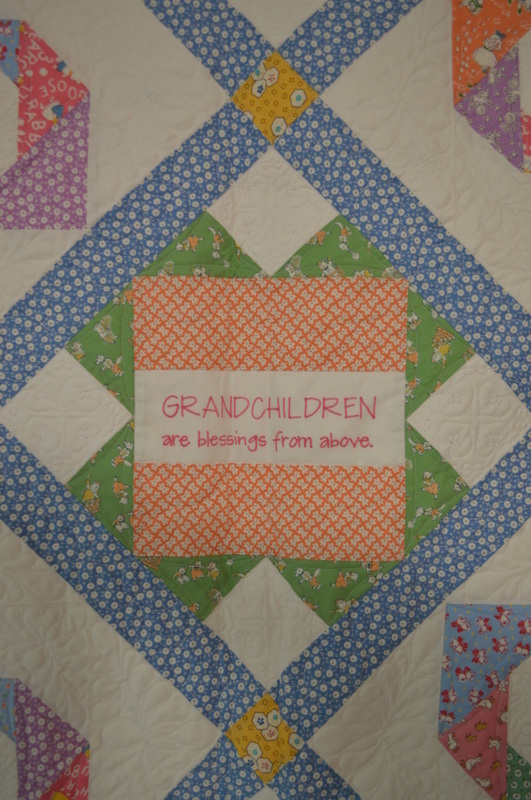 They were done with the Statler. 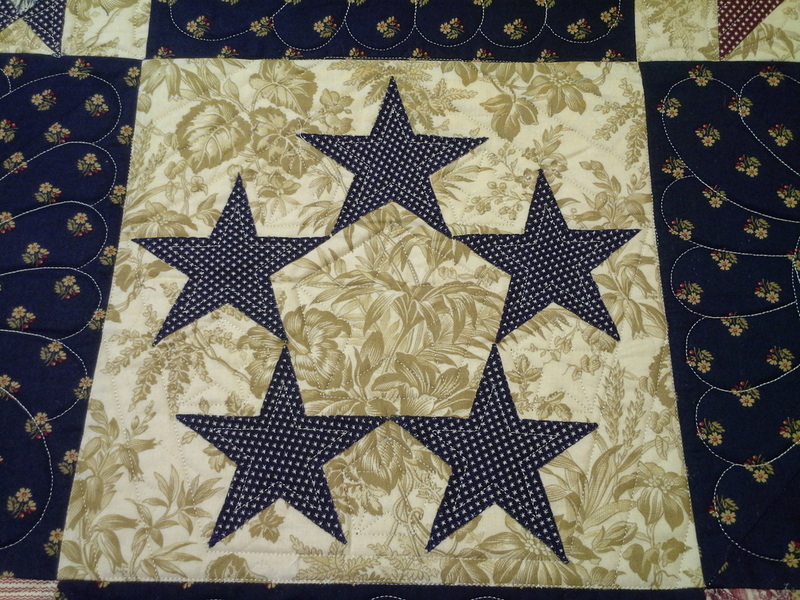 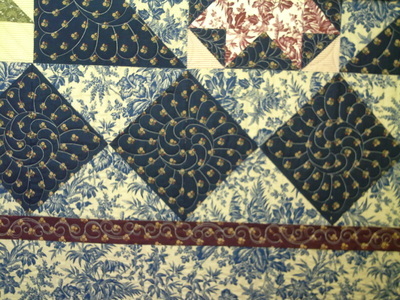 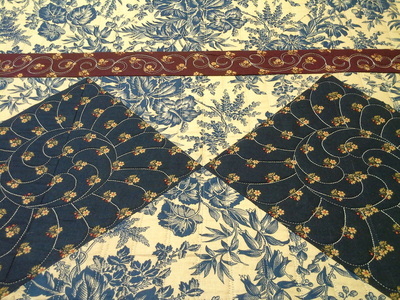 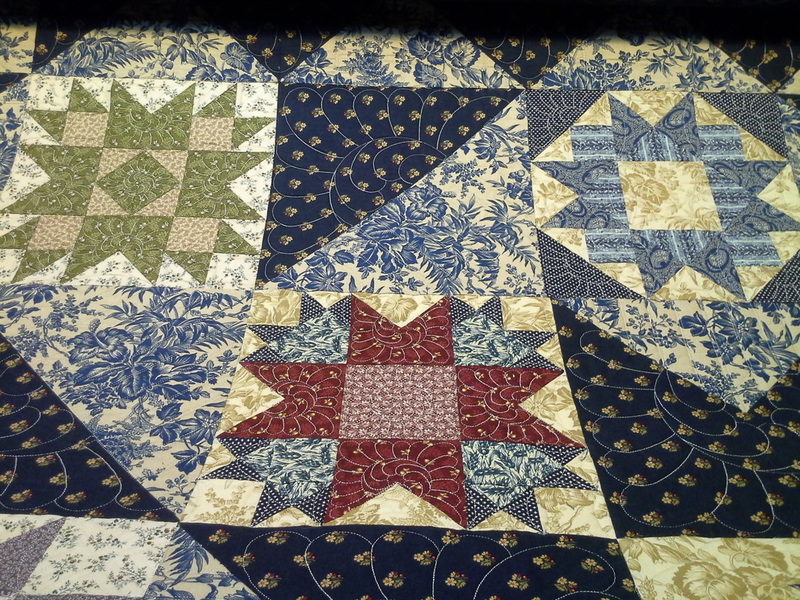 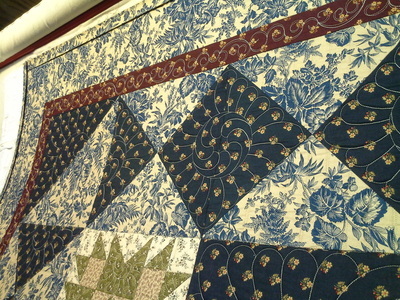 These are some quilts pieced by Susan R.
This is Pat S.'s Generals' Wives BOM quilt. These are some quilts pieced by Susan B. 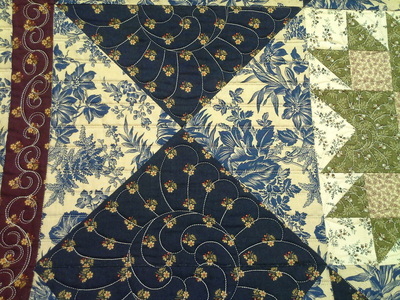 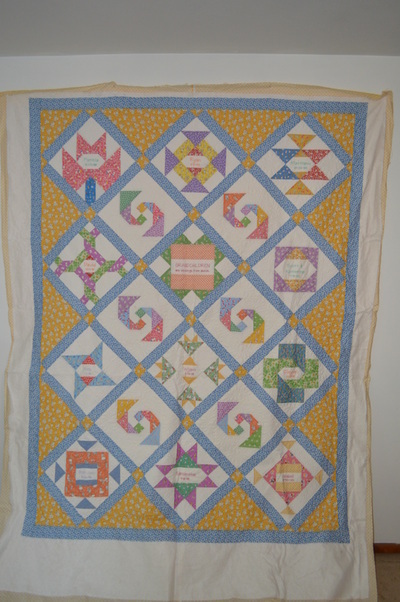 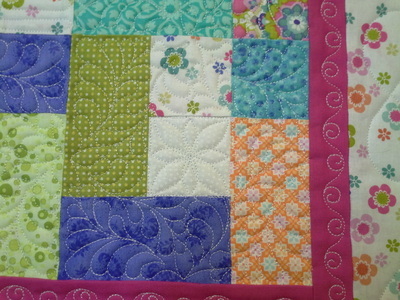 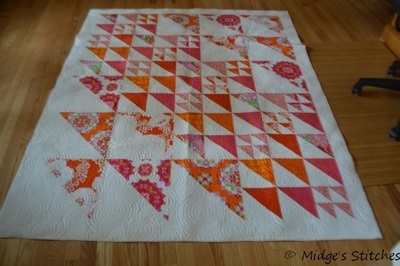 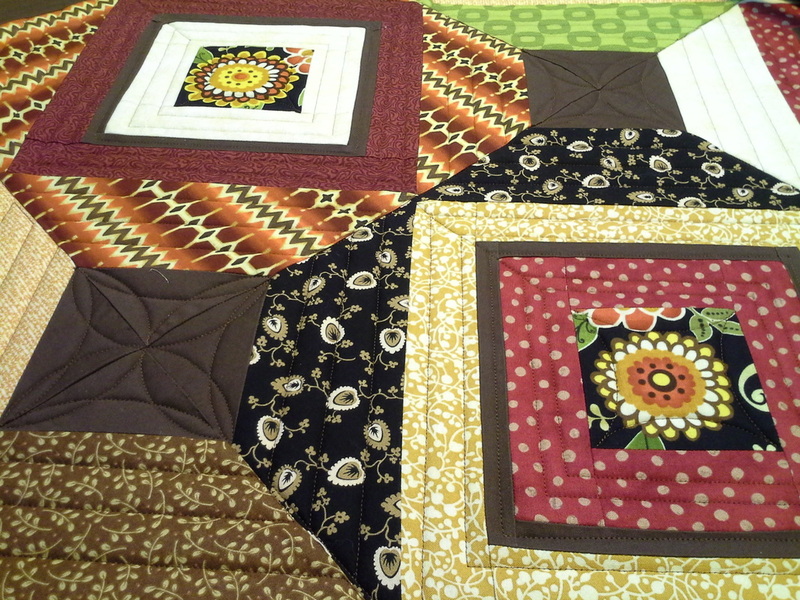 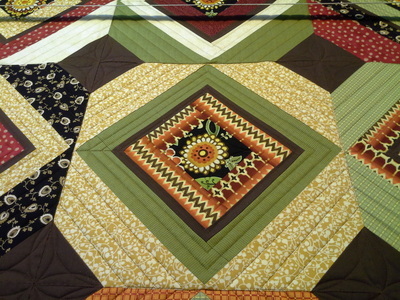 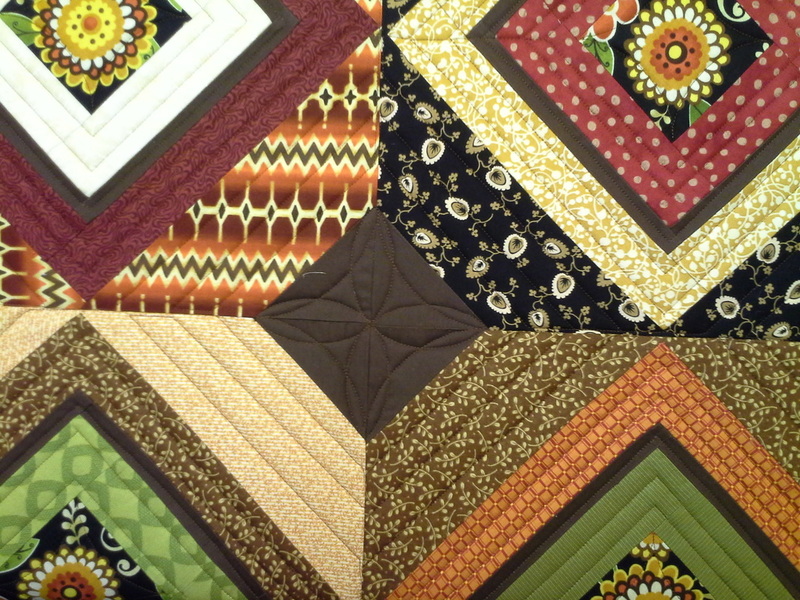 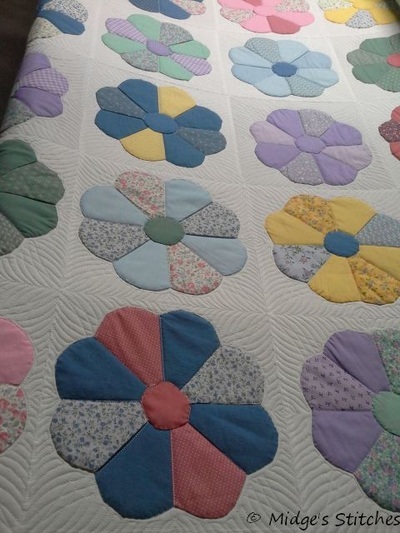 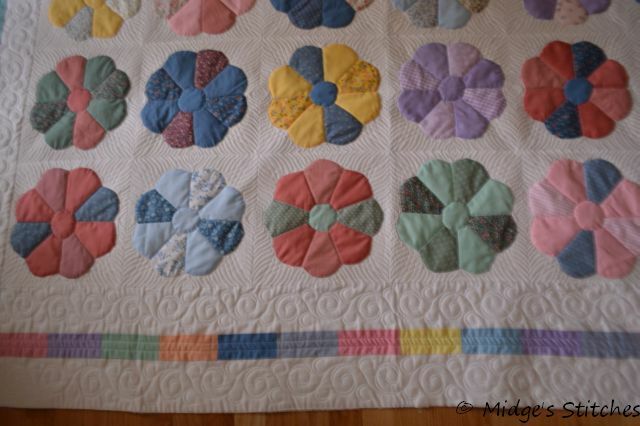 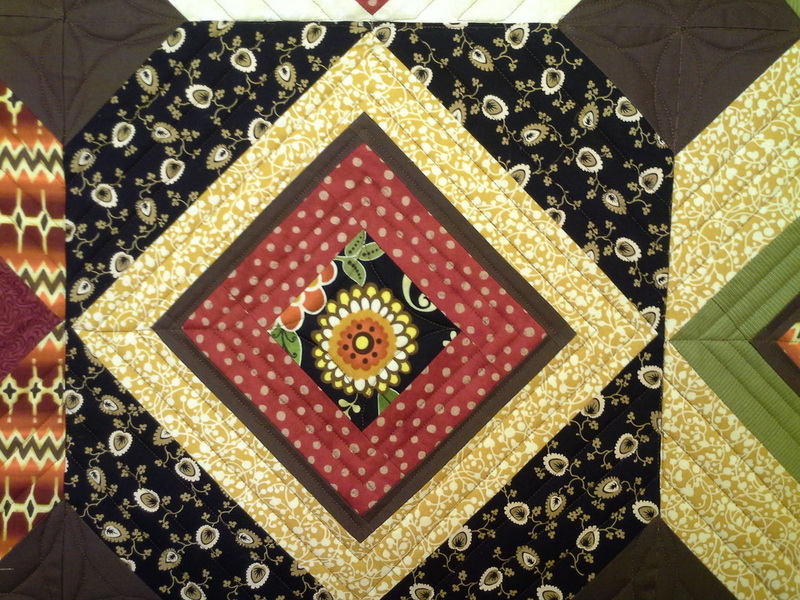 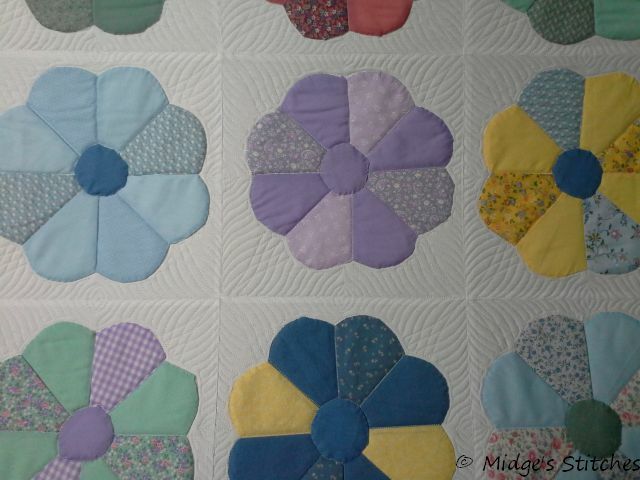 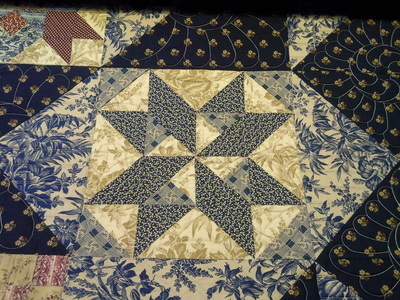 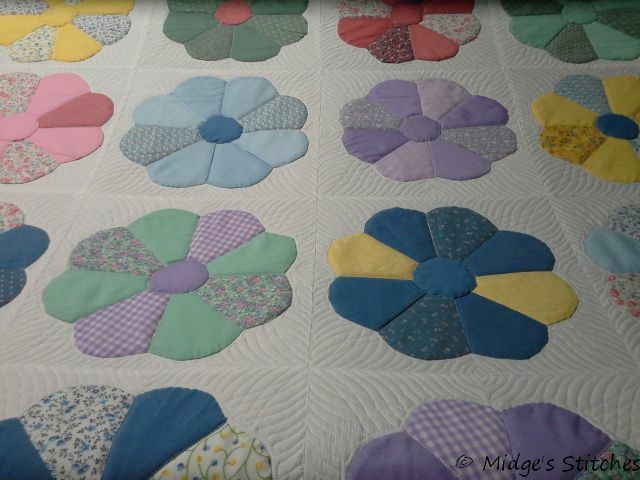 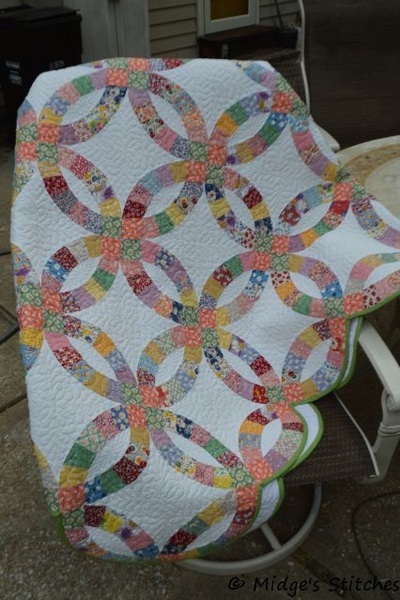 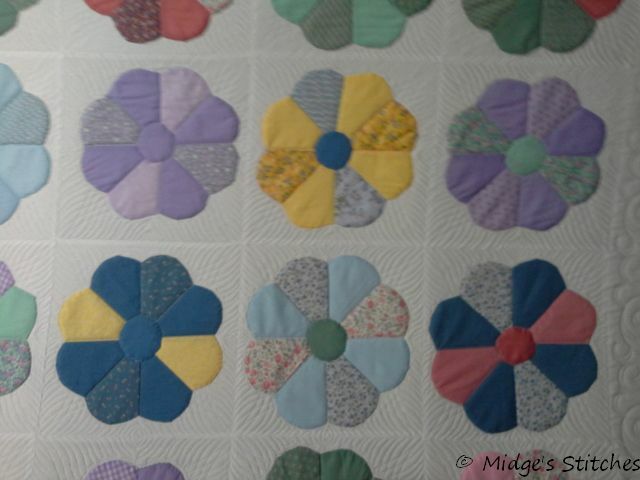 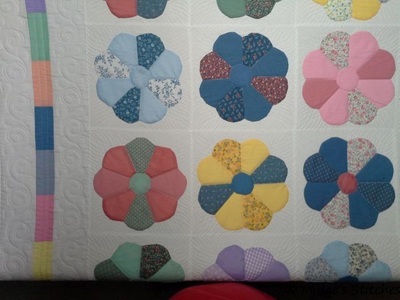 ﻿﻿﻿Some quilts pieced by Jane B. 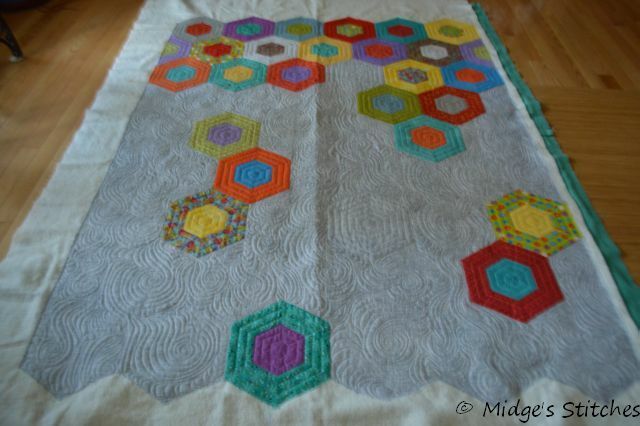 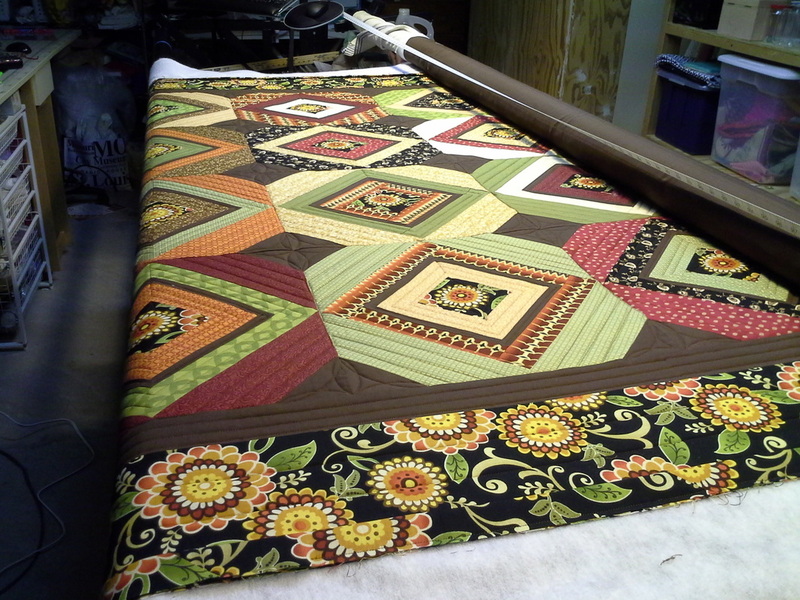 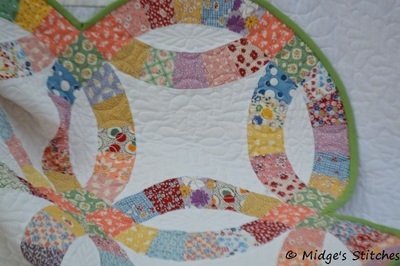 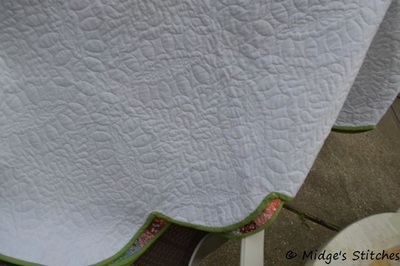 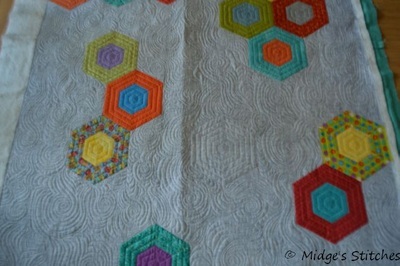 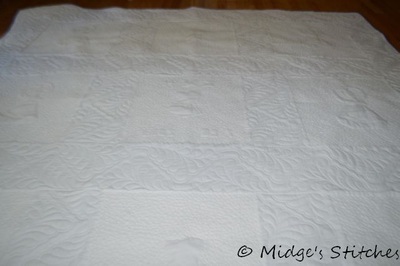 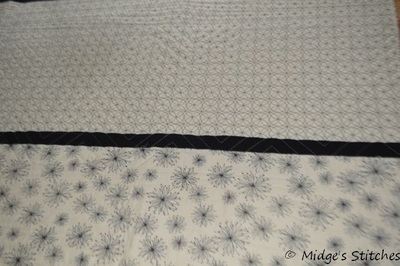 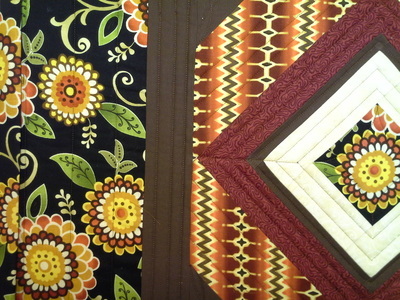 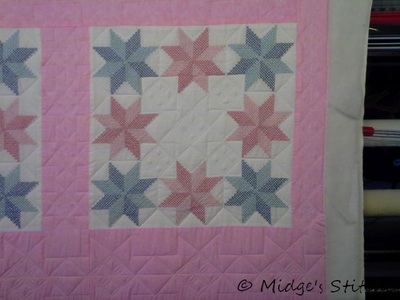 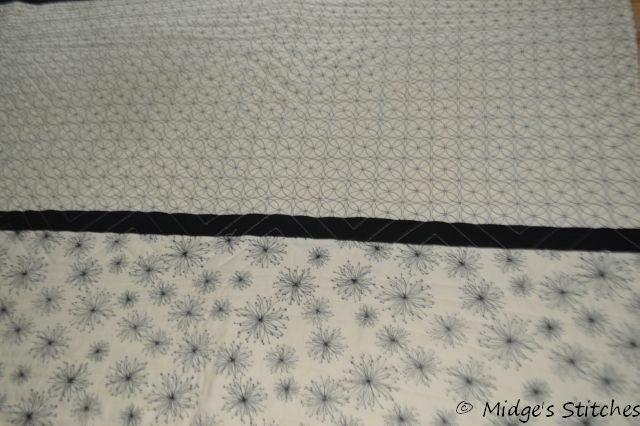 ﻿Here are two quilt tops with blocks hand embroidered by Rosalee. 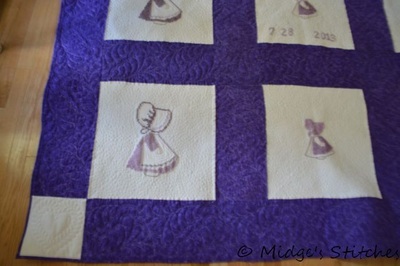 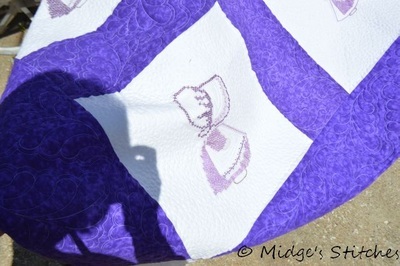 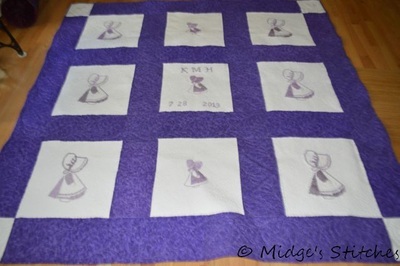 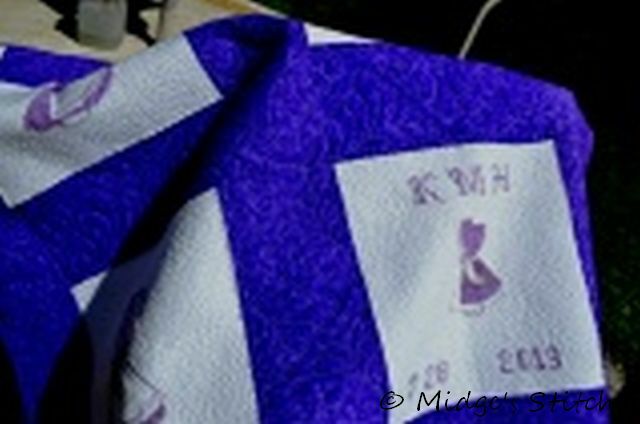 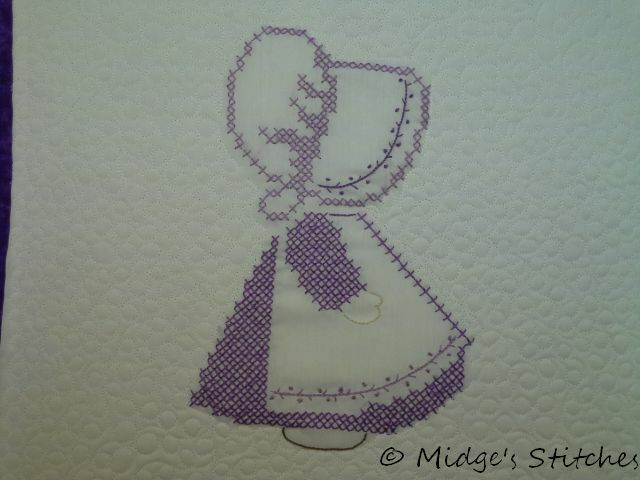 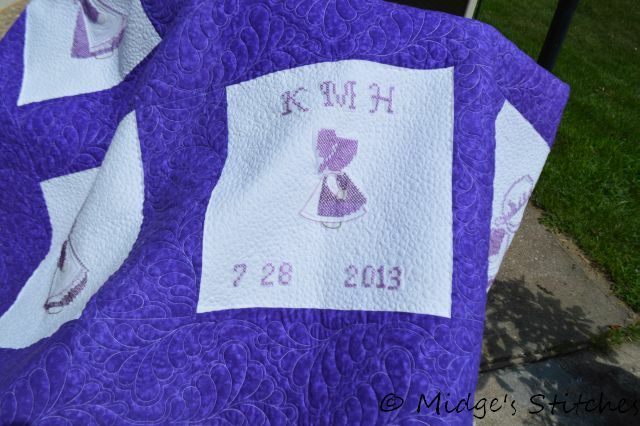 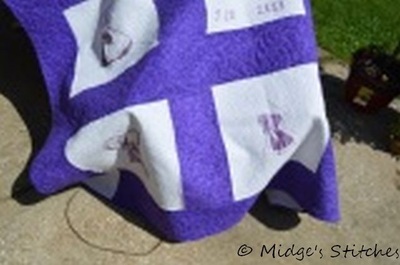 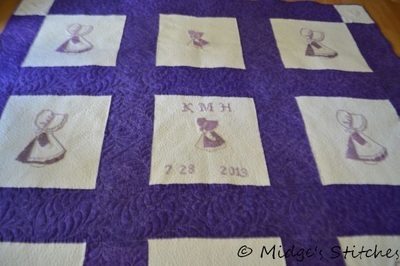 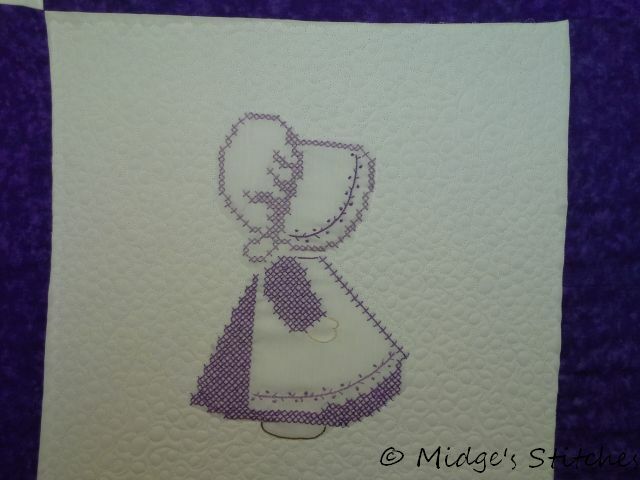 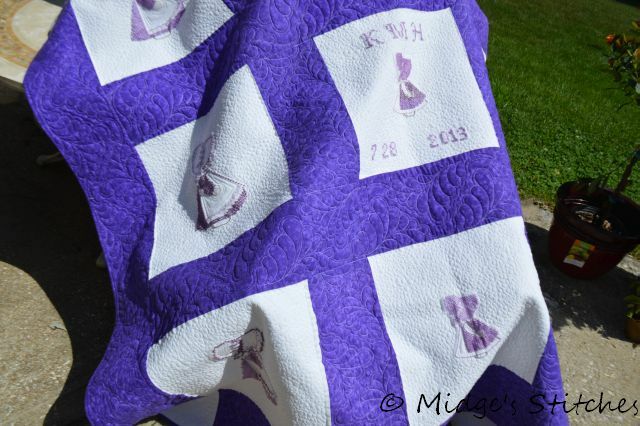 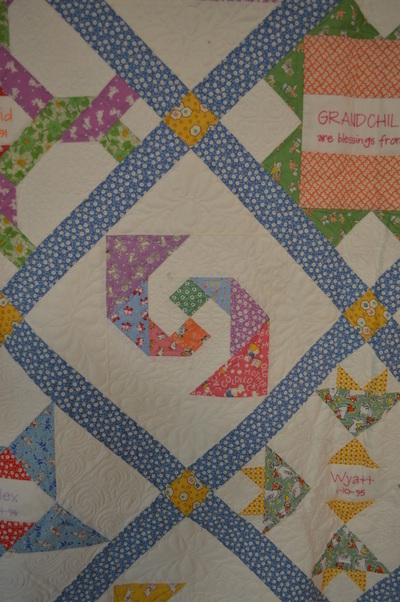 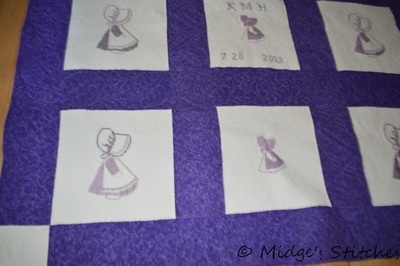 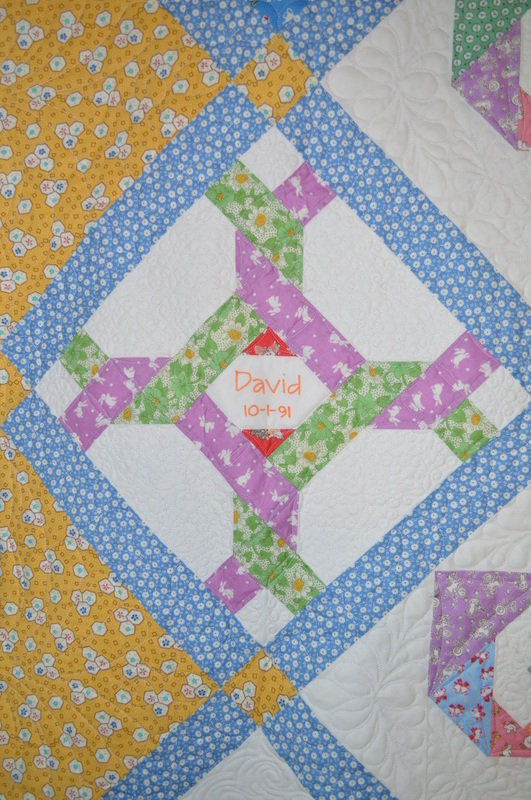 The purple Sunbonnet Sue with cross stitched blocks was made for her great-granddaughter's first birthday. 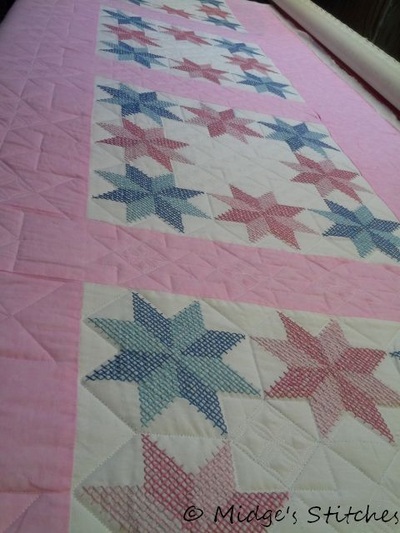 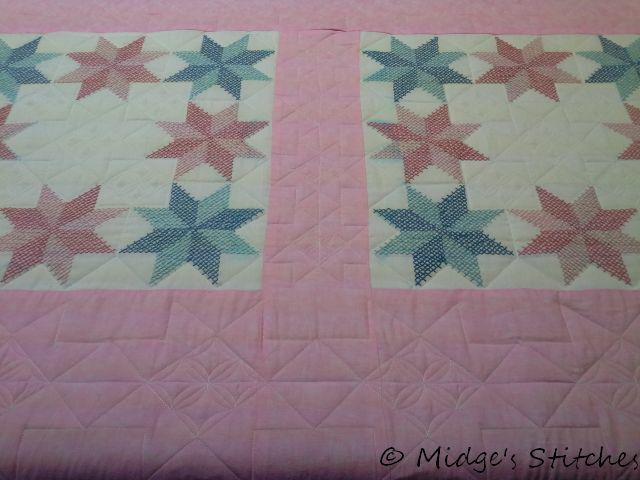 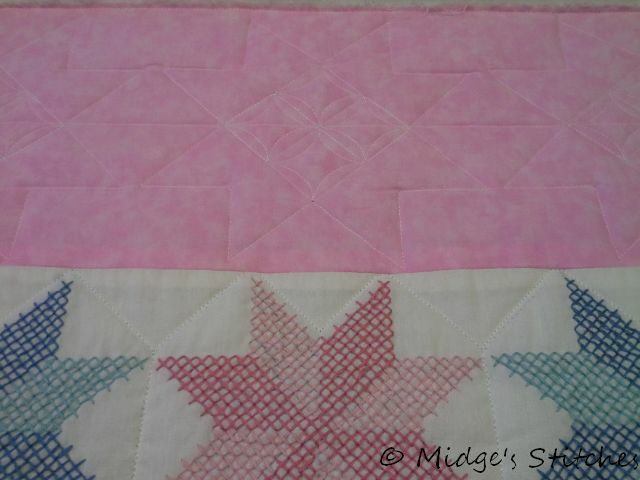 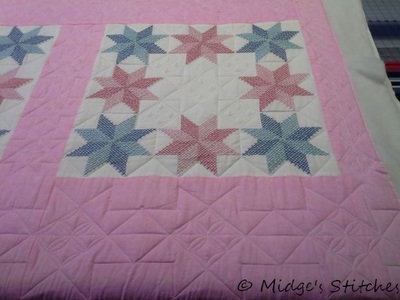 The pink Lemoyne Star with cross stitched blocks was made for her daughters.﻿ I took care to preserve the integrity of the hand embroidery. 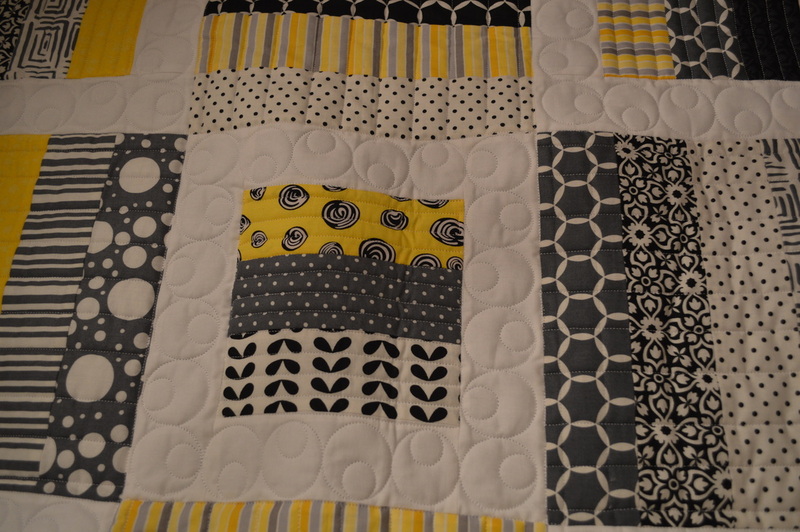 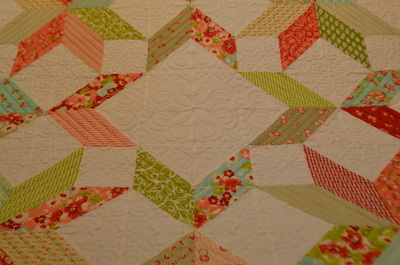 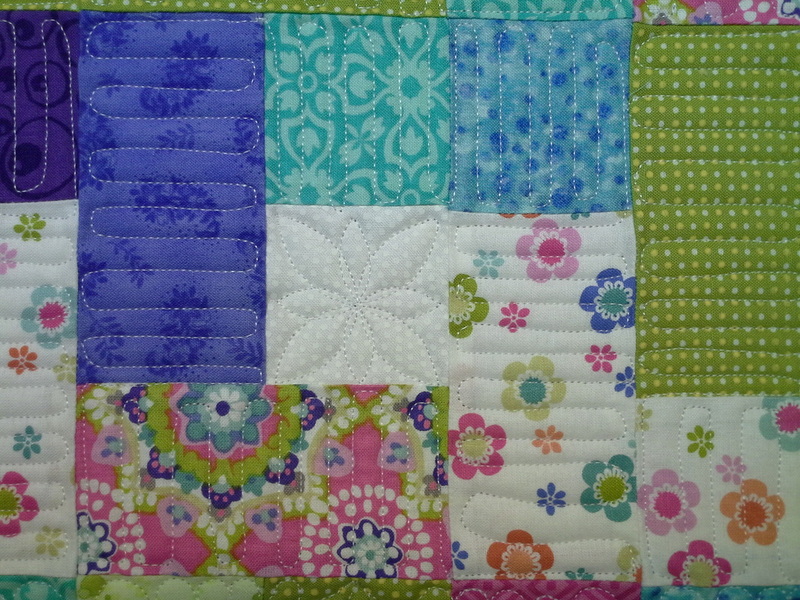 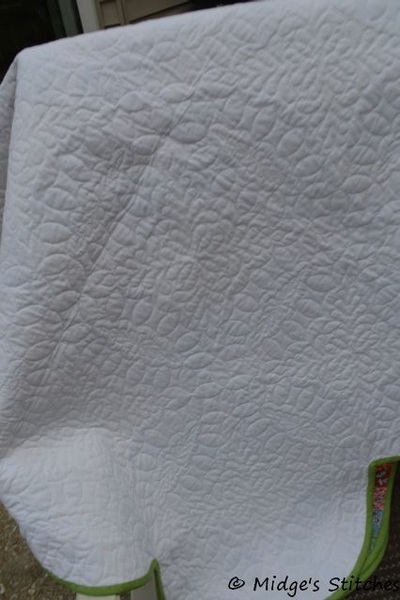 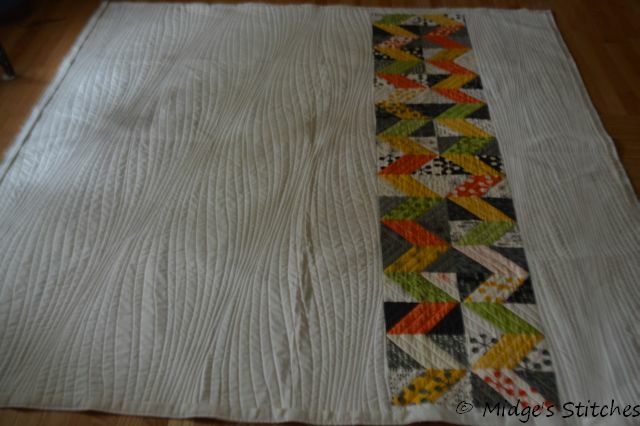 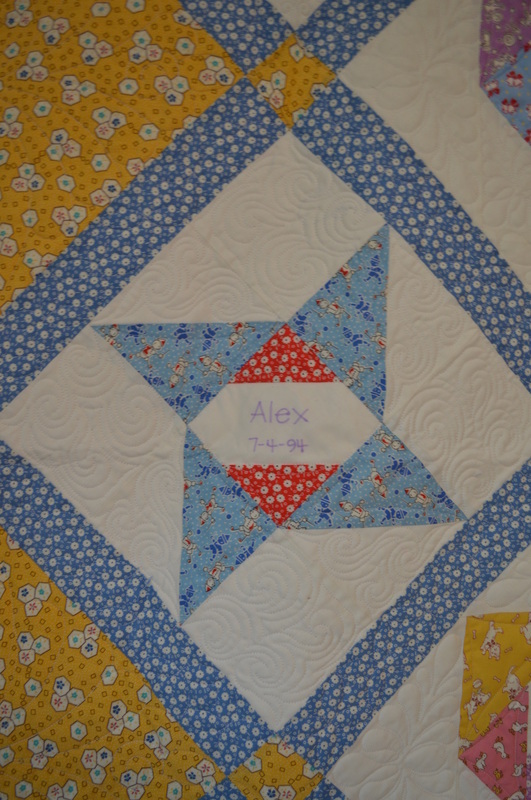 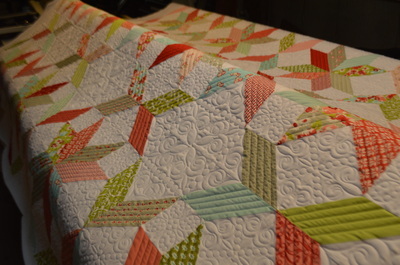 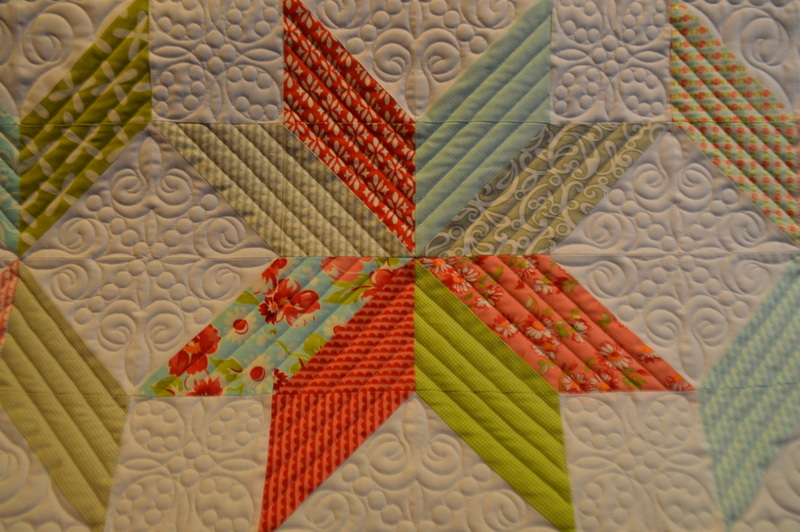 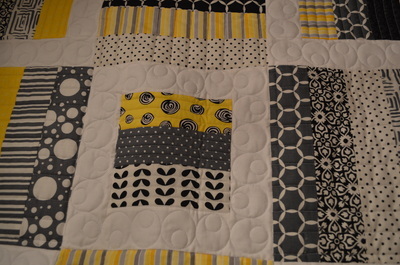 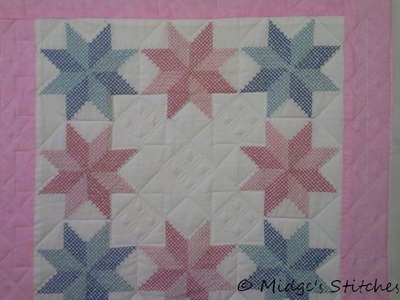 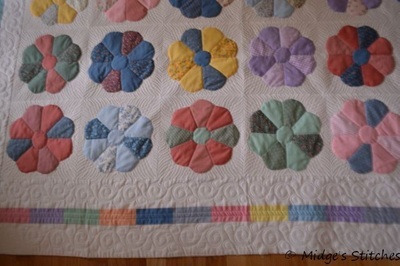 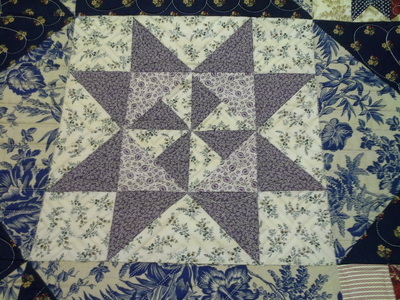 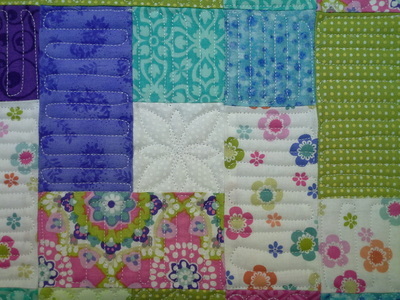 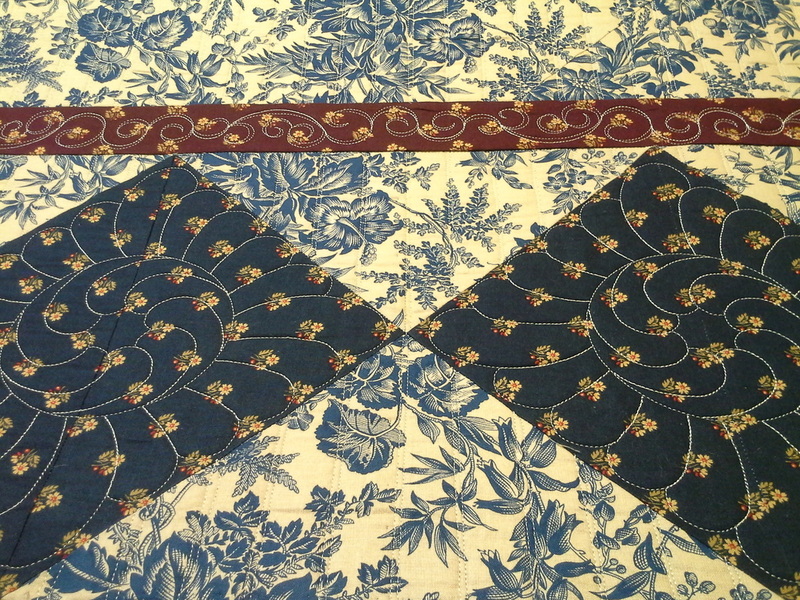 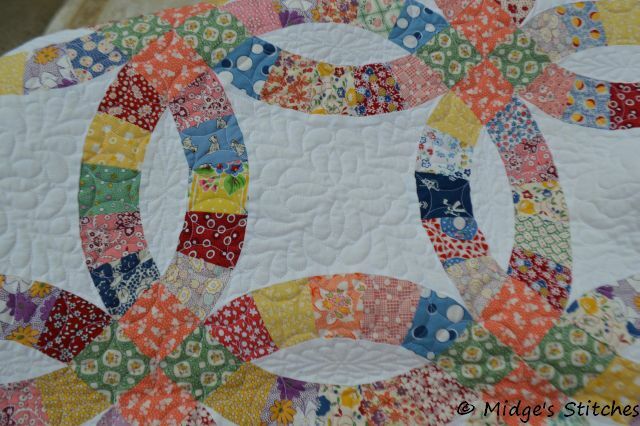 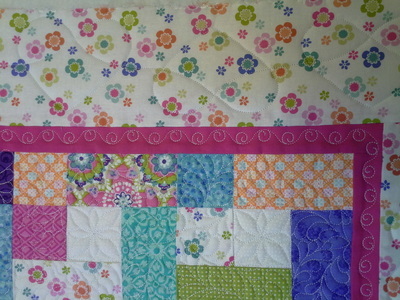 No quilting was done over the hand stitching. 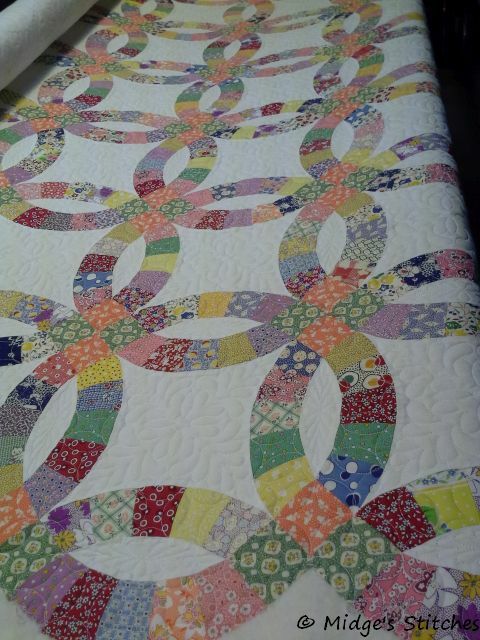 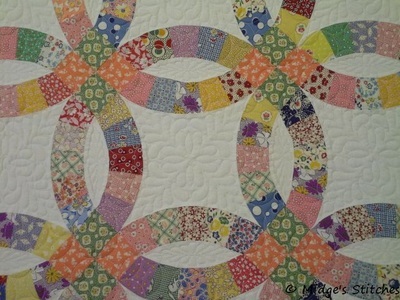 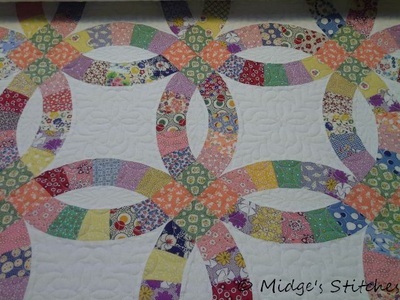 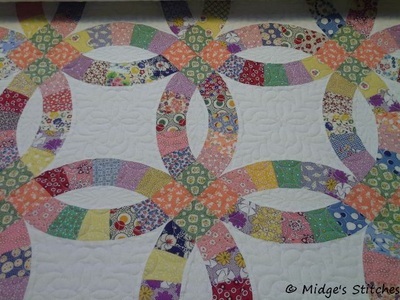 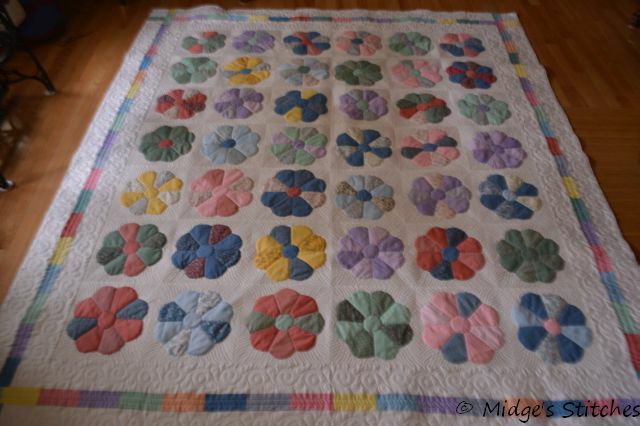 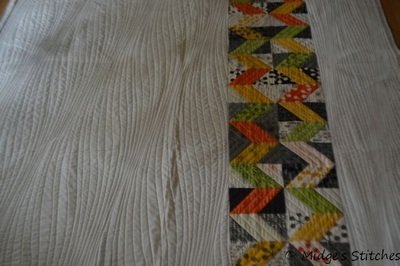 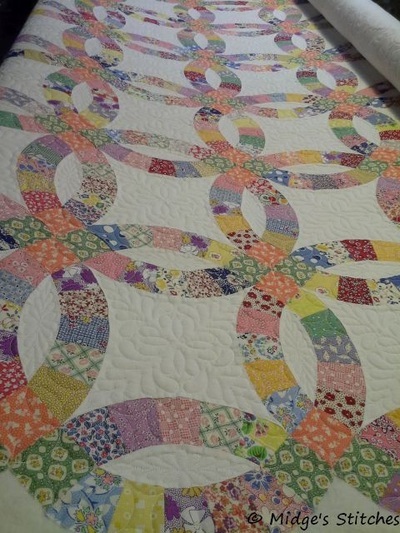 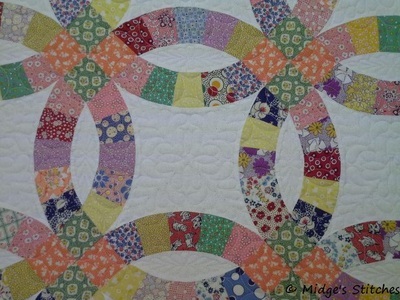 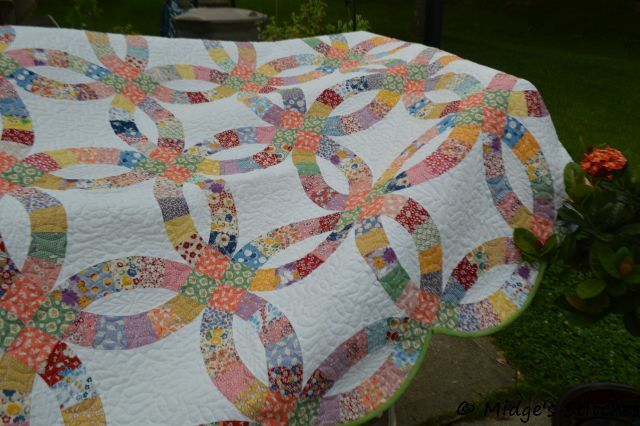 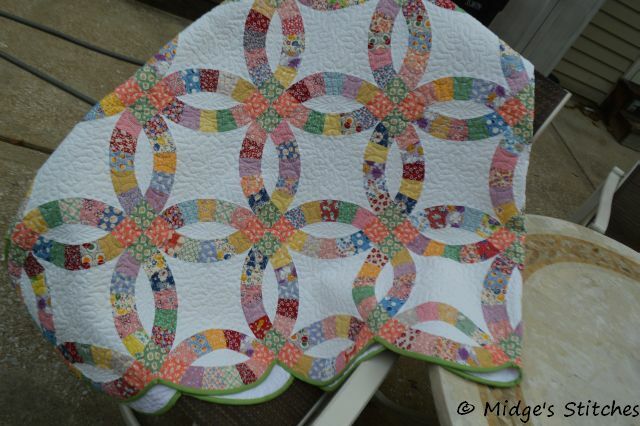 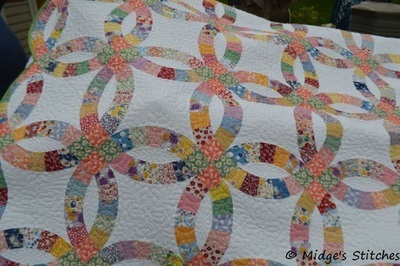 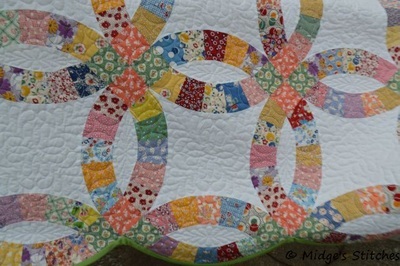 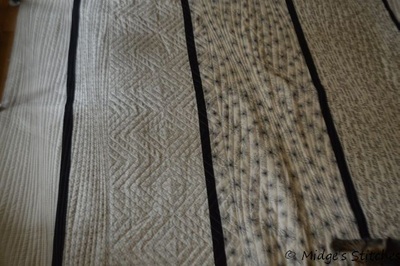 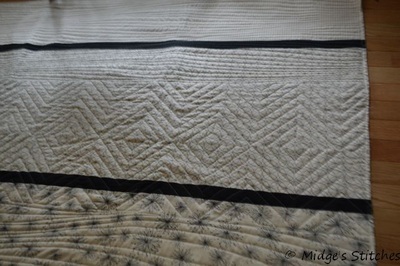 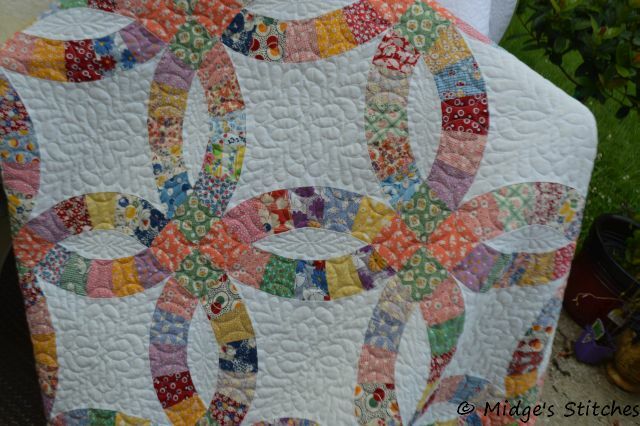 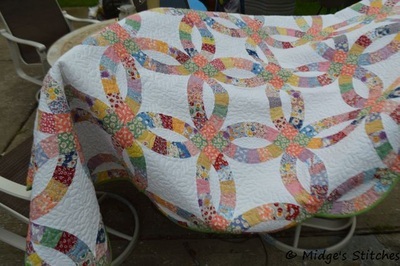 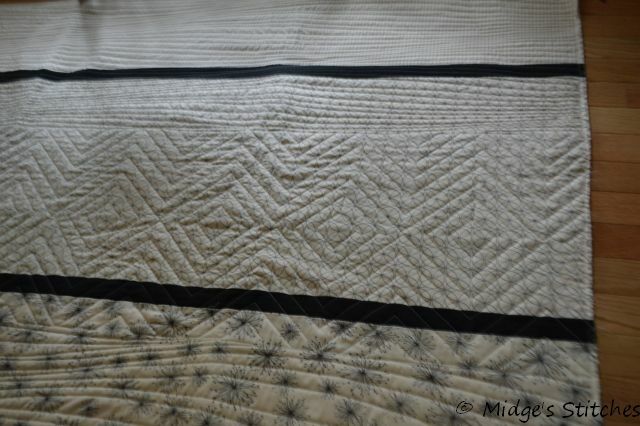 This is a Double Wedding Ring quilt pieced and quilted by me. I made it for Minnie, who babysat my two older kids when they were preschoolers. Her granddaughter, Emily, was their age and they used to play together. 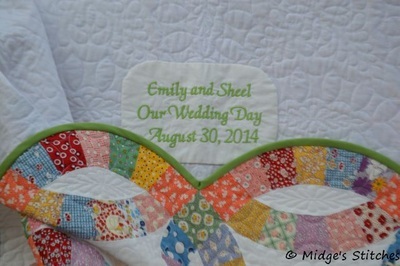 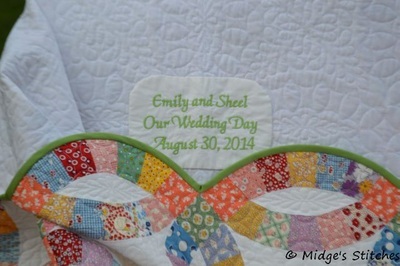 Emily got married and Minnie asked me to make a quilt for her as a wedding present. 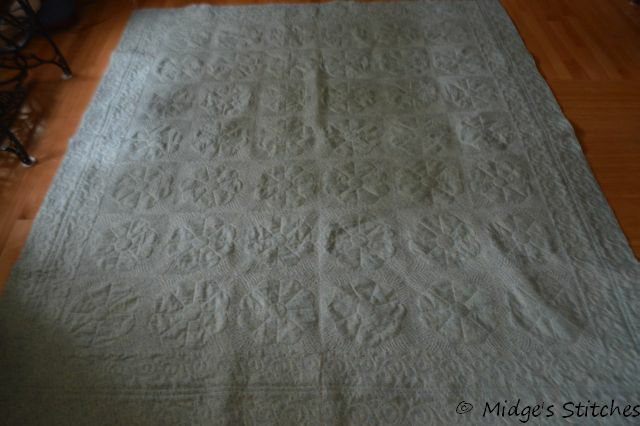 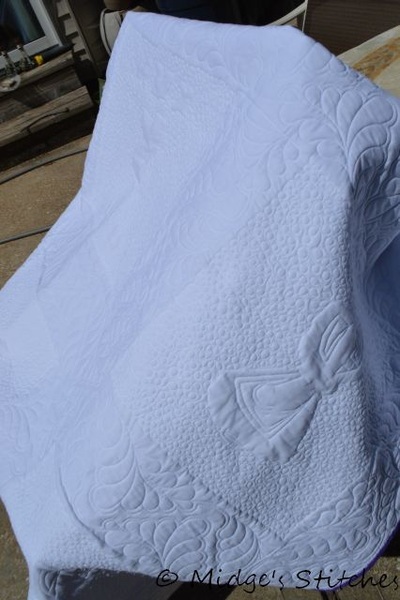 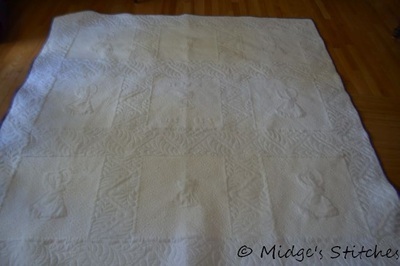 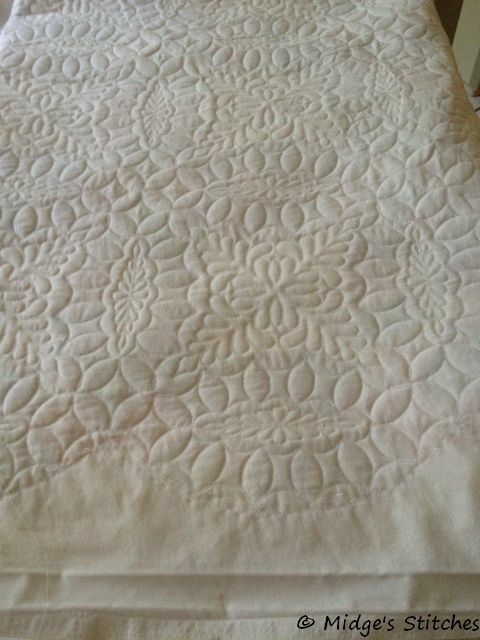 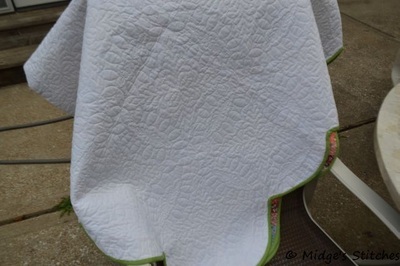 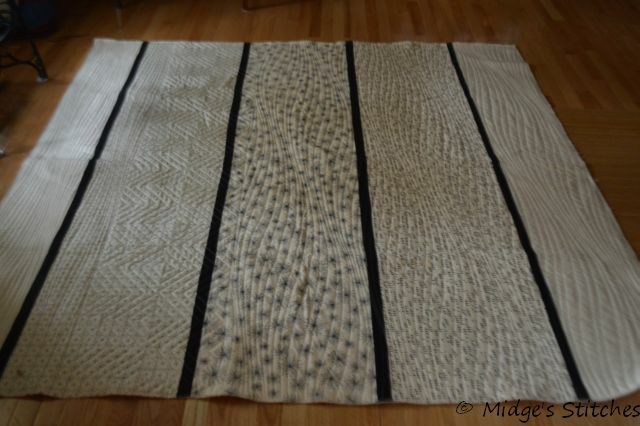 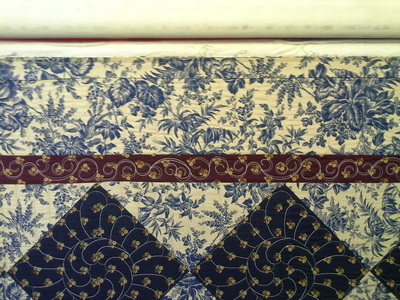 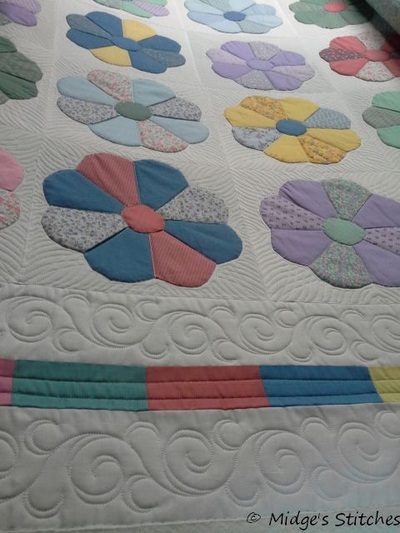 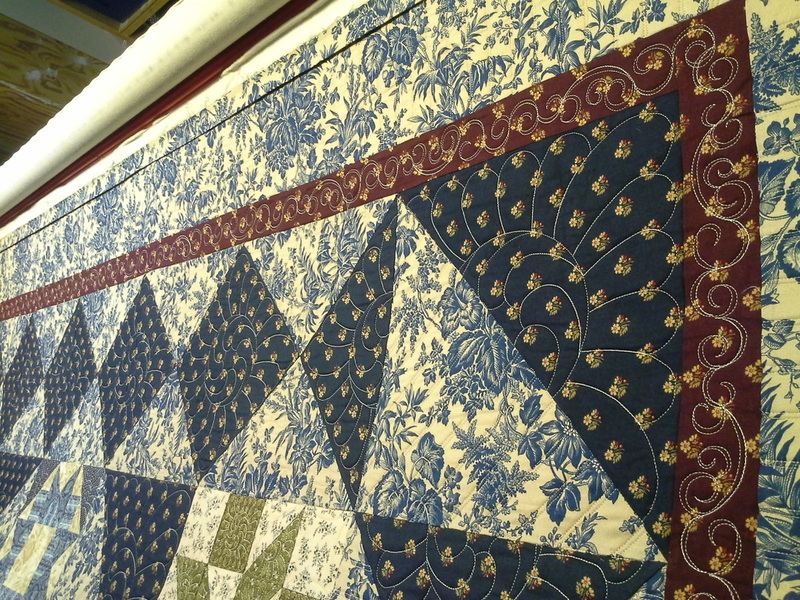 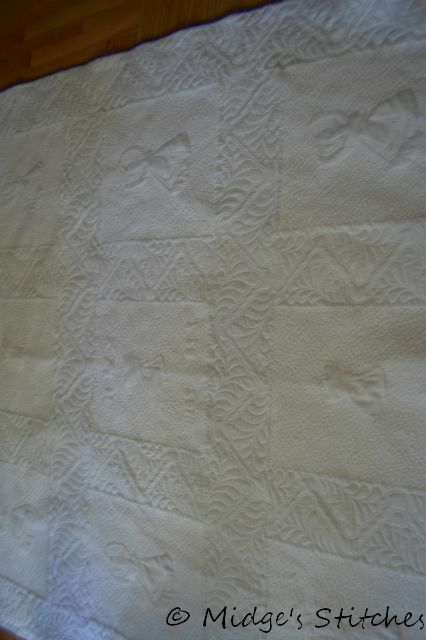 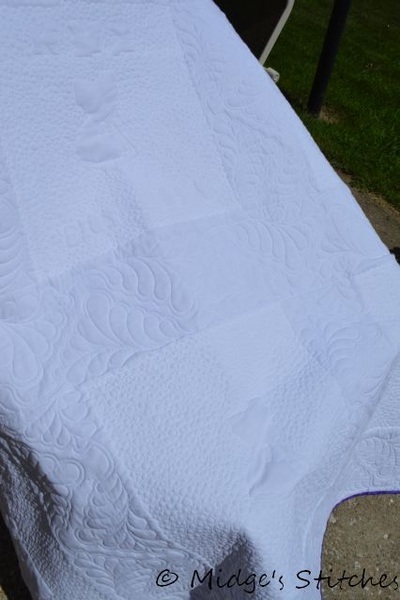 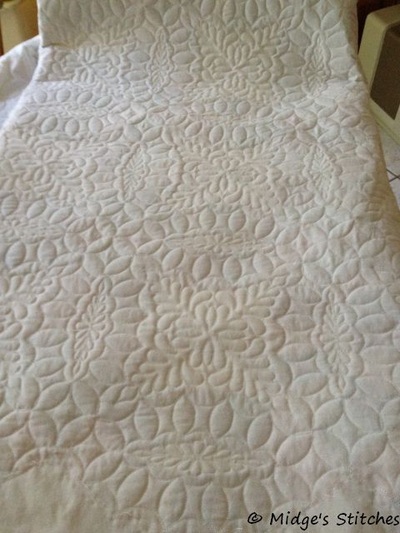 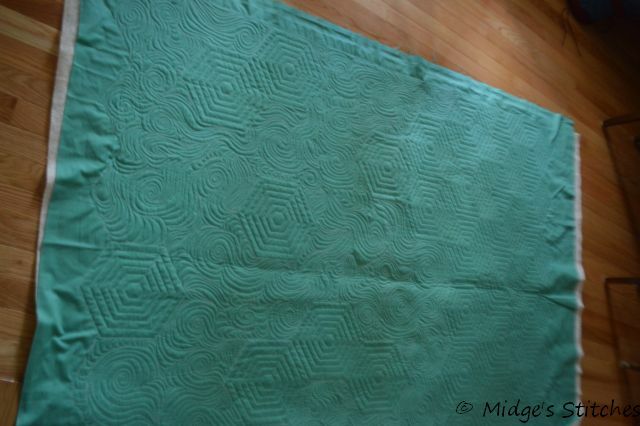 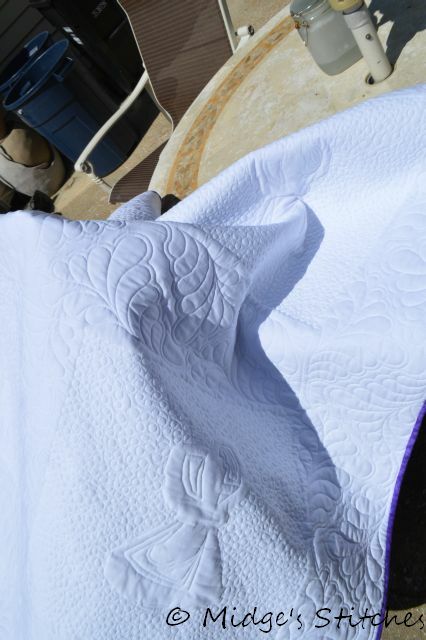 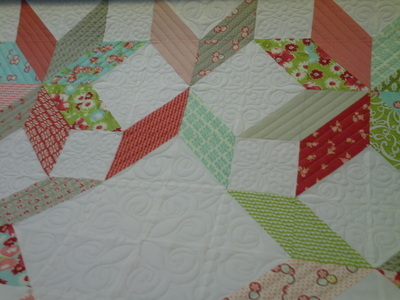 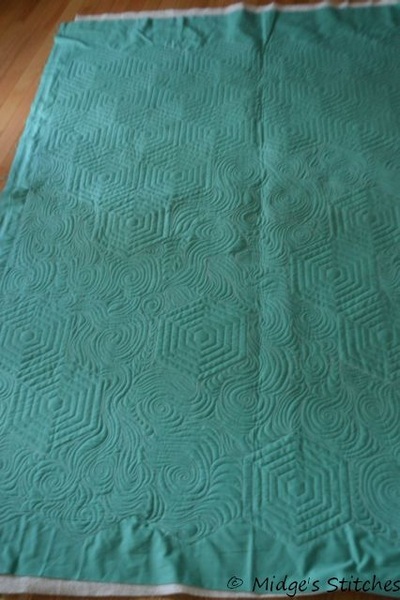 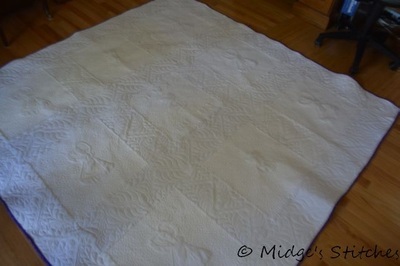 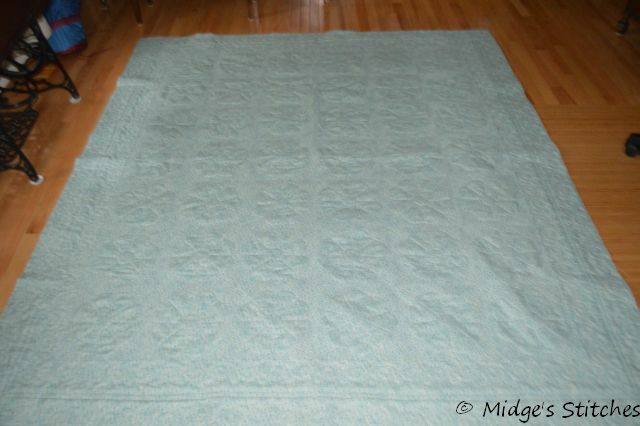 It's queen sized and was cut using an Accuquilt Double Wedding Ring die.